AdS Bacigalupo is an Italian football club from Lombardia region. Un giorno sul treno diretto verso casa un mio carissimo amico mi convinse a provare, poi giorno dopo giorno hattrick è entrato sempre piu dentro me! 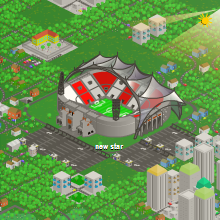 AdS Bacigalupo was founded on Jul 04th, 2003.
new star is the arena of AdS Bacigalupo. It has a total capacity of 60 000. This page was last edited on 23 May 2012, at 17:10.